In a parallel project funded by the New Hampshire Department of Transportation (Evaluation of Gusset-less Truss Connection to Aid Bridge Inspection and Condition Assessment), two scaled sections of a typical lower-chord gusset-less connection will be tested for fatigue loading at the UNH Structural Engineering Laboratory. The purpose of these tests is to evaluate the fatigue performance of intact welds as well as welds with defects located along the bend radius of the connection. The connection specimens will be exposed first to cyclic stress ranges consistent with the design stress ranges. Cyclic stress ranges will then increase up to the design allowable stress range, and if the specimen does not fail, stress ranges will be further increased until failure is imminent. 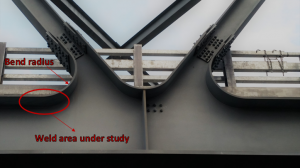 The results of these fatigue testing are important for understanding and quantifying the fatigue performance of this unique connection, to inform not only Memorial Bridge inspection protocols but also the development of reliable numerical models that could be useful for long-term bridge management purposes. In addition, the results obtain from this study will provide valuable data useful to evaluate the potential incorporation of gusset-less connections into future bridge designs.